Roman shades create a classic, timeless look, having been around for as long as the name suggests. For this reason, incorporating some into the decoration of your home is sure to never go out of fashion. Shades in this style are made from fabric which can be adjusted by pulling a cord. When lowered, they lay flat, looking sleek and clean. When they’re pulled up, they create neat rectangular folds. They’re not only stylish, but practical, and Sarit Arnesty Custom Drapery are dedicated to creating shades that complement the unique look and feel of your home perfectly. The type of fold can vary, so you’re not limited in style. Folds can be flat, looped, gathered, relaxed, pleated, tear-dropped and more. Whichever type you choose, the shades will look tidy and symmetrical, without any sagging. Roman shades can be made from just about any fabric, so you have a world of choice. You can choose a sheer fabric if you want to let a little light in, or a dense, dark one to maintain your privacy. Those aren’t your only options, though. There’s semi-sheer, opaque, and semi-opaque fabrics, too. At Sarit Arnesty, we’ll present you with a range of fabrics, so you can choose the one that filters the light coming into your home in exactly the way you want. The right fabric will not only create the perfect balance of light and shade, but have a beautiful colour, texture, and depending on your choice, pattern, too. Shades can be lined to further adjust the amount of light and heat that comes through them. For a private space such as a bedroom, thick lining can be used to completely black them out. For a living room or kitchen, something lighter can be used to create a more airy, lighter atmosphere. These shades will always be a good look. Since they have such a long history, their classical appearance doesn’t cycle in and out of style like other types of window coverings do. Since they were first created decade ago, they’ve continued to be used in homes and offices ever since, and for good reason. Outdoor Drapes and other window coverings can sometimes make a bold statement with a dramatic look, whereas Roman shades appear more subtle and soft. If you’re looking for something more seamless and minimal, this is the style for you. Whether they’re folded up or allowed to hang all the way down, they look neat and crisp. Any wires, railings or pieces of wood that are used to create the skeleton of the shade are concealed by the fabric, and cords hang inconspicuously at the sides. The mechanisms of Roman shades are simple and easy to control and adjust. You just need to pull a cord to adjust the length of the shades, pulling them up or down and locking them in place. There are no complicated mechanisms involved. Manually-adjusted shades are more energy efficient than the Motorized Roller Shades type. In controlling the amount of light that enters a room, they also control the temperature, all without the use of electricity. The shades can create a certain amount of insulation, depending on the type, thickness and weave of the material used. Sarit Arnesty Custom Drapery is run by a team of three dedicated people. 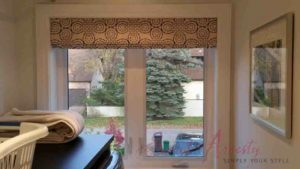 With our years of expertise in window covering design and manufacture, we promise to craft the best shades, drapes and blinds in the Greater Toronto Area and offer them to you at a reasonable price. 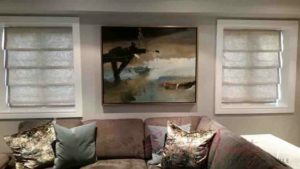 If you’re interested in buying Roman shades for your home, call us on 647-898-4073 or email info@saritarnesty.com to arrange to view our portfolio and see what we have to offer.